Travel to the heart of the Hualapai Tribe's homeland, where the Grand Canyon can be experienced from multiple breathtaking vantage points. See the majestic Eagle Point rock formation and the fantastic 360-degree view of the canyon walls offered by Guano Point. See the broadest canyon expanses from behind the railing, or venture out onto the stone yourself! The National Park features a state-of-the-art visitor's center and beautiful forested trails that lead to the most recognizable views of the Grand Canyon. Explore the inner workings and mechanics of one of the most marvelous advances in modern engineering. Then roam the observation deck and gaze down 700 feet to the Colorado River below. 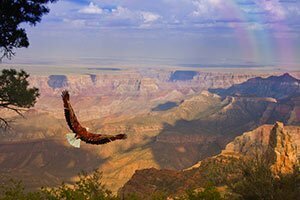 Travel in luxury to the West Rim, where 360-degree canyon views and landmarks like Eagle Point, a colossal stone likeness of the sacred Hualapai eagle, await you. Get the most magnificent view the Canyon's expanse on the glass-bottomed Skywalk, an architectural marvel that juts out 70 feet out over the edge. Grand Canyon West offers unique and exciting adventures you won’t find anywhere else and this is the day you get to experience all of them! Experience the beautiful desert scenery from the comfort of a luxury sprinter. See Hoover Dam and the Colorado River before reaching the Grand Canyon, the most magnificent landmark in the United States. Step out onto the Skywalk glass bridge for a unique - and breathtaking - view of Grand Canyon West. 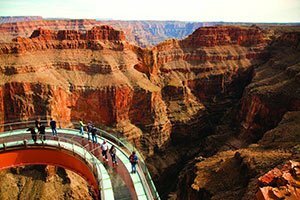 Complete your Grand Canyon adventure with a thrilling walk on the Skywalk glass bridge. Our state-of-the-art motorcoach will take you to one of the most scenic National Parks in the country. Witness the majesty of the Grand Canyon from several spectacular viewpoints and revel in the surrounding nature and forestry. 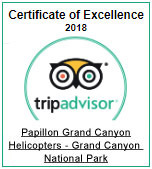 Complement your Grand Canyon National Park sightseeing with an incredible helicopter tour above the canyon. Let us drive you to Hoover Dam in a comfortable motorcoach. At Hoover Dam, you will explore its advanced innerworkings and can even stand atop this massive construction to look down 700 feet. See Hoover Dam from above by including a helicopter flight. Then enjoy a meal at the Hoover Dam Lodge. Enjoy an aerial tour over Grand Canyon West. Views also include Hoover Dam, Lake Mead and the Colorado River. Take a guided tour inside the Hoover Dam and learn about the history and inner-workings of the modern marvel. Afterwards see an aerial view of the magnificent structure (along with the Colorado River and Lake Mead) in a state-of-the-art helicopter. When the hectic personality of the Las Vegas Strip becomes exhausting, discover the peaceful natural atmosphere of the Grand Canyon. Our Grand Canyon Bus Tours will give you the opportunity to spend a day exploring the canyon with plenty of exciting sights along the way. Our luxury motorcoaches and sprinters are perfect for larger touring groups and those who would like a less labor-intensive journey. Tour packages include trips to either the South Rim or the West Rim, both providing breathtaking views of the canyon. Sit back and unwind as the wonder of the Mojave desert envelopes you and let us take you to the most remarkable spectacle in the American Southwest. 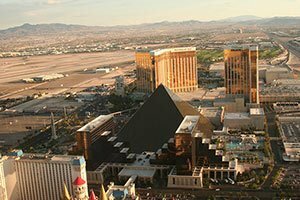 Your Grand Canyon Bus Tour begins bright and early when we pick you up right outside your Las Vegas hotel. We will transport you to our terminal for check-in and then you will climb aboard one of our beautiful, state-of-the-art sightseeing coaches. The first stop is atop the Mike O'Callaghan - Pat Tillman Memorial Bridge, which crosses the Colorado River. This immense piece of engineering, opened in 2010, connects the states of Nevada and Arizona. Ascending from the river below is the magnificent Hoover Dam - and it is perfectly viewable from the bridge! Our tour will stop on a pull-off point on the bridge so that our guests can take photos of this engineering marvel. After departing from the Hoover Dam, the city will begin to fade behind you as you approach the Mojave Desert. Before long you will be travelling through the Joshua Tree Forest, which has flourished for over 900 years with unique trees specific region of the country. Our large bus windows make it possible for passengers to photograph the gorgeous desert life as it passes. This land is sacred to the Hualapai Nation and upon reaching the Grand Canyon you too will feel the reverent air of the environment. Grand Canyon Bus Tours to the West Rim give guests the opportunity to experience the canyon as the Hualapai people did centuries ago - with a modern edge. This rim also features two major lookout points that give vastly different perspectives of the canyon. Upon reaching the West Rim, passengers will disembark the motorcoach for a self-guided ground tour of the canyon's many points of interest. Complimentary shuttles are available to transport you to each location. The adventure has just begun! The first stop is the Hualapai Ranch, a recreation of an Old Western boom town. Here you can interact with classic cowboys, Indians, sheriffs, and more. Take a wagon ride, watch the entertainment, or explore the gift shop. You can even learn to make a lasso, practice quick draw, and watch a gunfight demonstration! Then hop aboard the next shuttle for your first canyon view. You will arrive at Eagle Point, a vast stretch of canyon wall with a very special reason for its namesake. Emerging from the stone is the unmistakeable shape of an eagle spreading its wings in flight. Naturally eroded for centuries by the Colorado River, this magnificent form was held sacred by the ancient Hualapai people. You have the fantastic opportunity to gaze upon this monolithic stone bird just as they did centuries ago, but from a much different viewpoint: the Skywalk. The Skywalk is world-famous not just for its spectacular views of the canyon, but also its advancement in modern architecture and engineering. This massive bridge extends 70 feet out into the air above the canyon, allowing its visitors to stand nearly a mile in the air. It's U-shape gives visitors the opportunity to wander leisurely for 180-degree views of the canyon wall - specifically Eagle Point, which is directly across from the bridge. The most amazing feature is its glass floor. You can gaze down to the canyon floor and the Colorado River 4,000 feet beneath your feet. All of our West Rim Grand Canyon Bus Tours have the opportunity to upgrade for entry to the Skywalk, so you too can experience this marvel in modern architecture. Another phenomenal lookout at the West Rim is Guano Point. This peninsula of land stretches into the canyon and rises to form a small mount at the end, which guests are welcome to climb for an even higher view. No matter where you're standing on Guano Point, you will get an unbelievable 360-degree view of the brilliant red and orange-striped canyon walls. Take in the scenery then head back to the rim for lunch - some of the best barbecue in the West! Perhaps you would like your Grand Canyon Bus Tour to visit the South Rim instead. 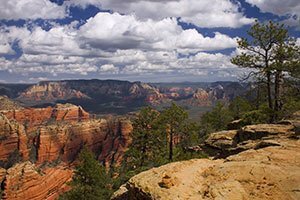 Here you can wander the trails of the Grand Canyon National Forest that guide you to the awe-inspiring lookout points of the canyon. This rim reveals the canyon at its most vast - deep, wide gorges that appear to stretch forever. Enjoy views of the tremendous striped walls from various points protected by guardrails or venture out to the unbarred lookouts for more views. Make sure to find Mather Point, a fantastic lookout, and pay a visit to the Grand Canyon Village. The South Rim also boasts the National Geographic Center where you can learn a wealth of information about the canyon's history and geology. Here you can also enjoy a meal, included in all Grand Canyon Bus Tour packages. The National Geographic Center also features an IMAX movie experience called “Grand Canyon: The Hidden Secrets”, a perfect addition to your tour - and a chance to get off your feet! After a long day of exploring the wonder of the Grand Canyon, climb back aboard your motorcoach for your ride back to Las Vegas. Our vehicles are designed with the comfort, safety, and sightseeing needs of our guests in mind. We offer two types of vehicles depending on your tour group size. Our motorcoaches are best to accommodate large groups and are complete with multiple televisions, an onboard restroom, air conditioning and personal climate control. Our sprinter vehicles are used for smaller parties. Sprinters seat up to 12 passengers and feature spacious plush seating. Both vehicles are equipped with a professional driver/guide, a PA system for announcements and tour narration, and supersized windows for photo-taking. Whether your adventure is just beginning or your long day of touring is coming to an end, you can rest easy and enjoy the ride on a Grand Canyon Bus Tour. If you find yourself needing a day away from the hustle and bustle of the Las Vegas Strip, consider spending a day amidst the vast desert beauty of the Grand Canyon. 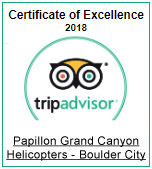 Papillon's Grand Canyon Bus Tours are the most affordable way to experience this once-in-a-lifetime destination for an entire day. Our platinum service from our vehicles to our guides and everything in between is the luxury you deserve. 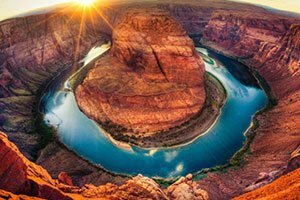 Sit back, relax, and let the magnificent Southwest landscape pass you by as we take you to the crown jewel of the United States: the Grand Canyon.